Good smokehouse! And beautiful it looks! Amazing…I’m a DIYer from way back but not sure I would attempt without those four guys to help! I think it is great. One question for you modern day farmer. My husband grew up on a farm, I am a city person. However, I would like to buy a small farm; I always wanted to do that. Anyway, my question is. Can one build a smoke house and due away with the modern day freezer or fridg. I would like to be able to go to the smoke and pick out dinner. Is that possible. In our modern times we add wood smoke for the flavor. There are many serious dangers in food safety if you don’t refrigerate or freeze meats, especially sausages as they are good breeding grounds for bacteria. Curing meats with nitrates and nitrites are a very important step in food preservation and the smoking is an additional step that is also an aid in the curing. I would recommend that you thoroughly research curing and smoking before you consider to do away with refrigeration and freezing, which I personally would not attempt. Unfortunately this design doesn’t work for hot smoking. I have a separate barrel smoker for hot smoking / barbecue. 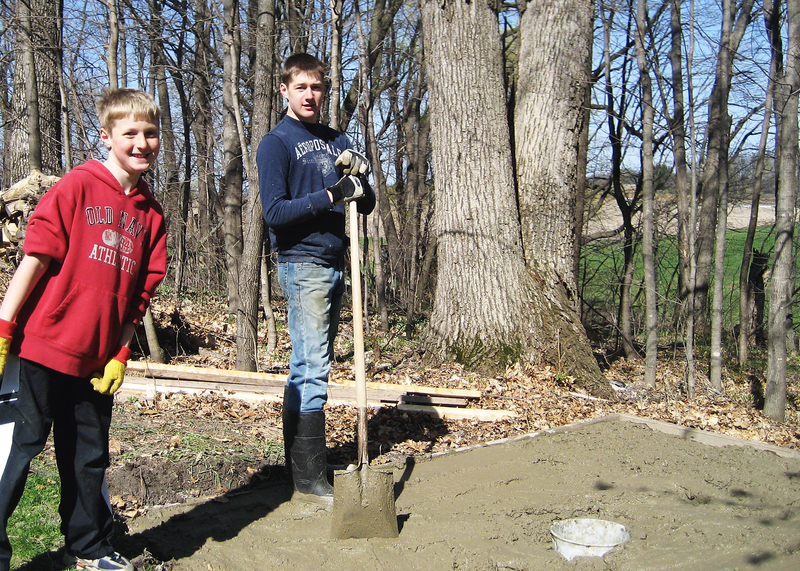 The eves are closed off by building a soffit with 2×4 cross members and plywood. Don’t worry about having the eves airtight as having the building breathe a little gets rid of excess humidity and moisture. Having small gaps along the sill plate also encourages better smoke circulation along the walls. I will ask my wife to post some new pics when she gets a chance. It is a good size. As you can trade meat for smoking services. Thank you for sharing! How would I make this a hot smoke house? I would like to build one like this but not for cold. Thank you for your time. This type of design does not lend itself easily to hot smoking, but if you are interested to pursue hot smoking here are a few of my thoughts. First is the location of the heat source. The current design has the heat source located 6-8 feet away from the smoke house and the smoke travels through the chimney pipe in the ground to cool the smoke. Therefore you would need to adjust the design to have the fire box directly next to the smoke house and use an insulated chimney to limit the cooling. Second issue that needs to be addressed is the heat loss through the roof. The current design gives good ventilation and easy transfer of heat through the roof to the outside. To retain the heat longer to reach higher cooking temperatures I would recommend using a 2 inch insulation board on the inside of the roof/ceiling. To avoid outgassing of insulation materials as they are heated, I would look for the type of insulation board that has a tin foil layer on one side. If you decide to modify my design for hot smoking, I would love to see pictures of your plans and final results. Um, I think it is actually much easier than you think to hot smoke in this thing – I have a Mennonite friend who has an almost identical building; the only thing he does differently is to put a pan of moist hickory shavings on the floor directly below the meat and fire it up. hi, great build. 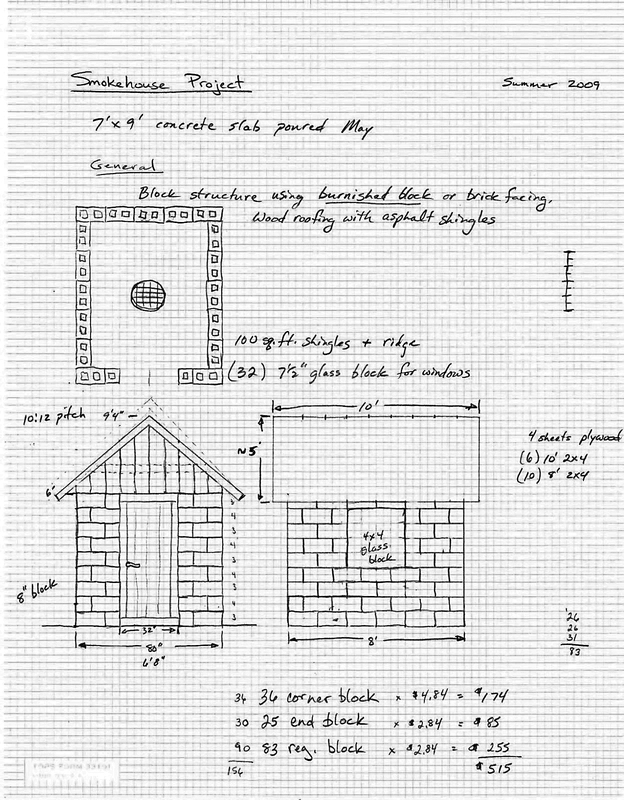 doing research on this and never really made my own smoke house. in terms of maintenance, how hard is it and how often do you have to clean the inside of the smokehouse? just worried bout the maintenance and health inspectors. thanks! Great design and building information. Thank you. You had the option of building your firebox below the smokehouse by use of the land’s natural slope. I live in Oklahoma where the entire farm is as flat as your dinner table. Do you have any suggestions on how I could use your plans since I would not be able to place the firebox below the floor level of the smokehouse? Thank you for your suggestions and information. Hi Russ – glad you got some value from the blog posts on the smokehouse. You are absolutely right that I was able to take advantage of the natural terrain. Obviously digging a pit to bury your firebox and have good access to it would require a substantial size hole. The only other viable option that I can think of is to elevate your smokehouse with a couple of courses of blocks, and then replace the concrete floor with a wooden one. You won’t get the same cooling effect from direct contact of the chimney pipe with the ground, but you would get some cooling nonetheless. Maybe even making the chimney pipe longer could provide more cooling. The net effect of losing the cooling from the ground is that you would have higher heat rise in the smokehouse, which means you would have to smoke when it’s colder outside. To be on the safe side with cold smoking you should always stay below 60 degrees inside your smokehouse. With my smokehouse arrangement I get only a 10 degrees temp rise when I fire up the smokebox. You would have to experiment with an alternative design and see what your temp rise would be. Hope I have provided at least some sparks for ideas on how you could adapt my design for your environment. Thank you for the helpful ideas. Since it is best to have temperatures at or below 60 degrees that will make using the smokehouse to the months of November thru March in the Oklahoma climate. What is the difference (advantage Vs. disadvantage) of heat smoking Vs. cold smoking? Does one preserve better or longer? 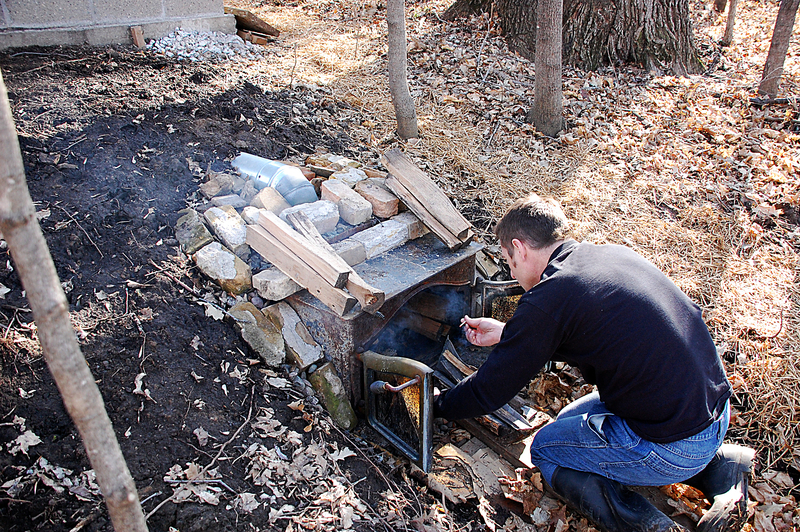 My interest in making a smokehouse is for preservation without the taste of freezerburn. Russ, I haven’t done much research into meat preservation, but I believe that most preservation techniques use primarily curing (salting and nitrites) and drying processes. Smoking can be part of a drying process but is most commonly used for flavoring the meat. I can give you some tips on the difference between hot smoking and cold smoking. Hot smoking is also commonly referred to as barbequeing. During the hot smoking process you are also cooking the meat at the same time. This is a great process for brisket, fish, chicken, and other non-cured meats. Cold smoking does not cook the meat, it only imparts the smoke flavor. Cold smoking works well for sausages, chicken, ribs, pork chops, cheese, and nuts. For example you will find on the blog some information on sausage making. Our family butchers an entire hog (or two) which we smoke and then put into the freezer and cook later. There are also some good books you can find on Amazon. Good luck! Thank you. You have been a great help. What a lovely smokehouse. I’m so impressed. However, I question why the window? In time it will get smoked over but I was raised the meat shouldn’t be exposed to light when it’s hanging in the smokehouse. Thanks for stopping by our blog. There are actually 2 windows, one on each opposing side. There is no electricity in the smokehouse, so no artificial light, and hence my desire for adding a window for improved visibility inside. I actually have to give credit to the window idea to Uncle Greg 🙂 Have you ever tried to check on your meats in a dark smokehouse filled with smoke? Not easy. I have to admit that I’ve never seen a window in any old time smokehouses either, but I’m assuming that was more of a practical matter of cost and material availability. You can probably tell from the photos on our blog that we have a “gentleman’s farm” and not a real working farm, and don’t the windows make the smokehouse even more attractive?!?! The glass blocks that I used are very sturdy and surprisingly enough they don’t seem to be getting smoked-over even after 3 yrs of use. I will probably clean them off someday, which should also be pretty easy to do with an oven cleaner similar to what I use on the glass doors of the wood fireplace in our house. As far as sunlight exposure to meat, here are my thoughts. In general I would agree that direct sunlight on uncooked meats is probably not desireable as it will tend to heat the surface of the meat and that would encourage bacteria growth. However, my smokehouse is for cold-smoking meats only and that means that I am smoking meats only when the outside temperature is below 50 deg F., which ensures that bacteria growth is not likely. In addition, with the thick glass blocks, smoke filled house, and trees overhead, at best the windows would allow in only heavily filtered light and never a chance for direct sunlight. If product quality is the truest testiment to the addition of the window, I can tell you that our cold smoked meats are some of the best that I have ever tasted! Good luck Ken. Would love to see pictures when you are finished! 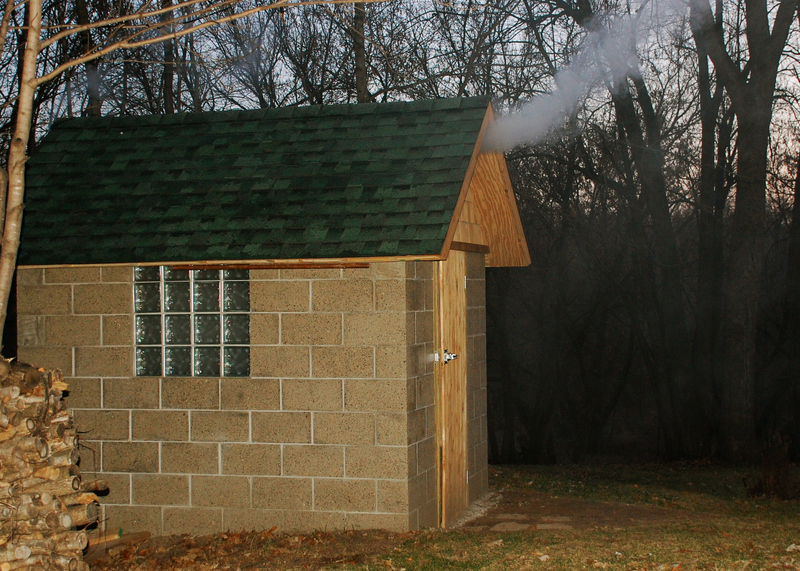 In a word…Fantastic.My son posted your Smokehouse build on my page..and a few more,but this is definitely the one we are going to build within the next few month’s.Thank you for taking the time and sharing. Jim. Here in the Panhandle of Florida, how do you keep roaches ,spider’s, rat’s and other unwanted guest from getting in the smokehouse ? Sorry it took me so long to reply, but just noticed your comment. We definitely get spiders and other insects in the smokehouse, but roaches and rats are not an issue around here. Our winters pretty much kill off any living thing. Also, anything we smoke either hangs from the rafters or is on metal racks, so spiders and such are of no big concern. Fantastic! It is my dream to have a smoke house like this! We have a small homestead, not a working farm. ( although I work pretty hard here.) We are working towards self sufficiency. We currently breed/raise American Guinea Hogs for sale and our own meat. Smoking our own meat would be a blessing. Now I need to get my husband motivated to build one just like yours, lovely and efficient! 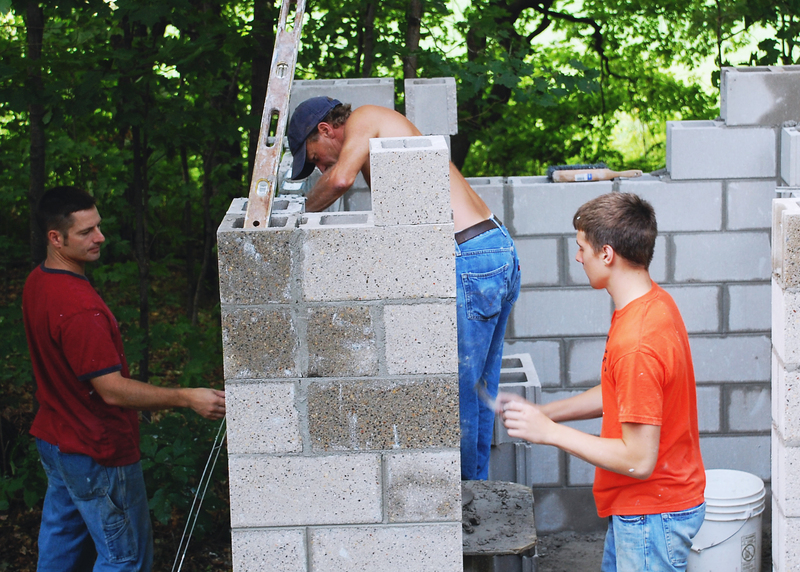 Pingback: Build a smokehouse from cement blocks | DIY projects for everyone! Can this be used for hot smoking also? if I may? Trying to budget this project. 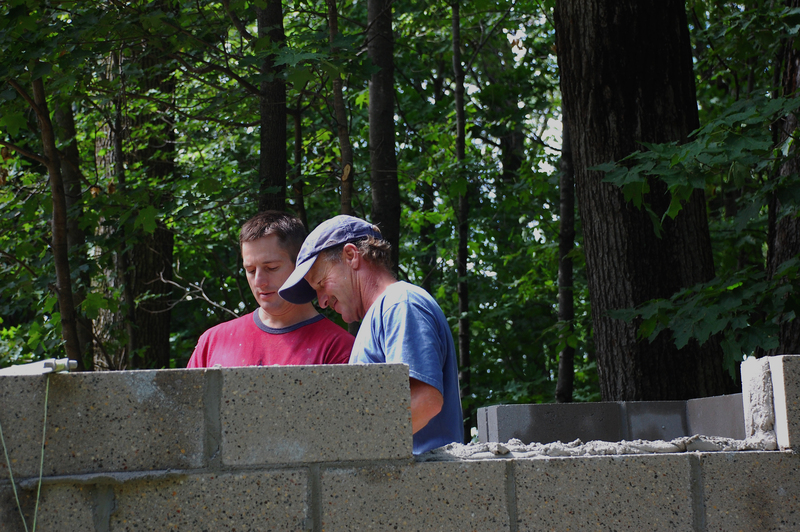 We built the smokehouse in 2009 and at that time, the cost of the blocks was around $550.00. 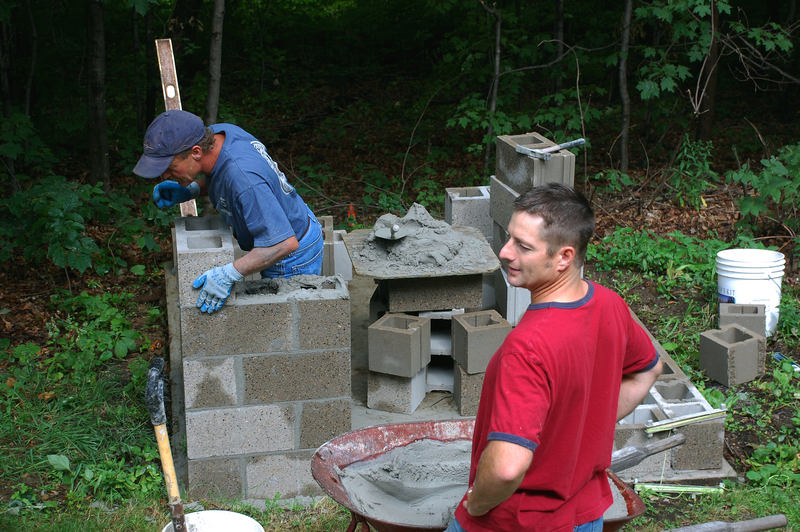 Ours came from a company called Amcon Block & Precast, Inc. I hope that helps!